Your home office is just as important as any other room in your home. You spend an adequate amount of hours in a space with everything you need for a relaxing work environment. 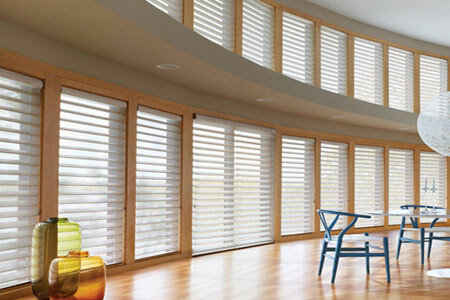 Correct window light combined with functional shutters are especially important when arranging your home office. Your work environment should reflect only the most helpful tools for concentration and relaxation. Before you buy just any old window covering, consider these shutter types for the most convenient options available. Venetian blinds are a popular choice for a home office because of the sleek horizontal slates that offer full coverage and are easy to pair with any style room. Say you’d like to shed some sunlight halfway through the room. These blinds offer the ability to fold up to your desired length and still provide coverage. And they offer various options of style and design so there aren’t any shortages when it comes to creativity. From solid wood to a faux-wood finish, your office wouldn’t know the difference. Although this type of blind is typically made of plastic, you may find more fiber and texture options nowadays also. Roller blinds are a perfect addition to your home office if you need a distraction-free work space because it leaves little to no outside light coming in. Roller blinds are free of any handling and will need to be removed completely when you decide to clean them. These are a practical yet chic way to design your home office without spending a fortune. You can expect to get some wear out of them because they are a very durable choice for your home office. These old fashioned style roman blinds have a come a long way since the 1950’s. Not only can you find just about any style, design, or color that suits your home office, they offer the look of whimsical drapes when lowered and they form a clean horizontal fold when raised. They also provide dim shading for a more ambient setting and an even coverage for the entire room. You will find these faux wood blinds in practically any home or office. Before you throw away the idea that wood shutters are just plain and boring, they actually offer a modern feel to any home office and can be customized to fit any size or style window. These are most convenient for home offices because they completely shade desired areas of the room, they are easy to clean, and offer a more sophisticated look and feel to the room. Although they are basic, you’ll be able to choose from options such as poly or even a smooth aluminum that add grace and style to your room. Are you considering interior shutters for your home office but don’t know where to run with your ideas? Contact a local expert for advice and an estimate your desired window shutters. These trusted professionals can offer solid advice and assistance when it comes to choosing the right blinds for your home office without breaking the bank.